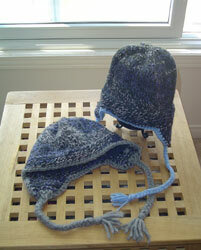 Well here it is approaching Summer and I finally finished the winter hats I want to make for the girls. I used Thrope by Kirsten Kapur and I really like this pattern. 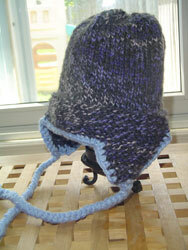 It’s simple but looks interesting, plus you get the added warmth of ear flaps. I’ve made a few other small items since my last knitting post, but nothing of great importance. I’ve started a second Owl for little G and have the wool to make a third one for little A.
I have a great deal of ambition to make all sorts of things, knitted and sewn for the new house. We’ll see if my new found free time in September will allow me to create them all :). Oh and I’ve discovered a fablous yarn and sewing shop a mere 15 minute walk from the new house. Look out bank account.